Resveratrol is a polyphenol, which promises many health benefits, e.g. prolonging life span, and to treat heart disease, diabetes, cancer, Alzheimer’s as well as other chronic conditions. However, resveratrol has a low bioavailability and shows a rapid clearance from the blood plasma. The research team of Dr. Kushwinder Kaur has developed a rapid and highly efficient technique to prepare ultrasonically a resveratrol complex for superior bioavailability. Resveratrol is a highly effective polyphenol, which can be extracted from plants, e.g. grapes, berries or nuts. Whilst reseveratrol is known to be a powerful antioxidant which helps to prevent or cure diseases, this phytonutrient has only a low bioavailability. Therefore pharmaceutical and nutraceutical manufacturers are searching for special formulations to improve the delivery of administered resveratrol into human cells. Dr. Kushwinder Kaur and her research team from the Panjab University, Chandigarh have developed a rapid and simple one-step complexation of resveratrol. By sonicating a mixture of resveratrol and cyclodextrin, the resveratrol is enclosed into the cyclodextrin (i.e hp-β-CD). Cyclodextrin acts as host compound and acts a effective drug carrier that release the resveratrol into systemic circulation. For the ultrasonic formulation of the resveratrol inclusion complex 4.38 x 10-3 mol 2-hydroxypropyl-β-cyclodextrin (hp-β-CD) and 4.38 x 10-3 mol resveratrol (Res) were mixed in a glass container with the minimum amount of the solvent mixture (ethanol : water = 1 : 9). The mixture was sonicated for 15 min at 180W using a Hielscher UP200St ultrasonic device. The end product was obtained by freeze-drying. The prepared inclusion complexes were characterised by FTIR, UV-visible absorption spectroscopy, NMR, TGA, DSC, XRD and CHNS analysis. The analysis data showed that the resveratrol molecules were wrapped neatly into the cavites of hp-β-CD. In the most traditional way, the IC was prepared by a standard stirring procedure (reported in the literature by Bertacche V. et al. 2006). The second alternative method involved mixing of 4.38 x 10-3 mol hp-β-CD and 4.38 x 10-3 mol Res in a glass container with the minimum amount of the solvent mixture (ethanol : water = 1 : 9). The mixture was irradiated by microwave for 100 s at 800 W to formulate the product. Water was evaporated under vacuum. The data obtained after 25, 50 s at 200, 400, 600 W revealed incomplete complexation. The ultrasonic preparation of resveratrol inclusion complex resulted in an improved stability and water solubility of resveratrol. 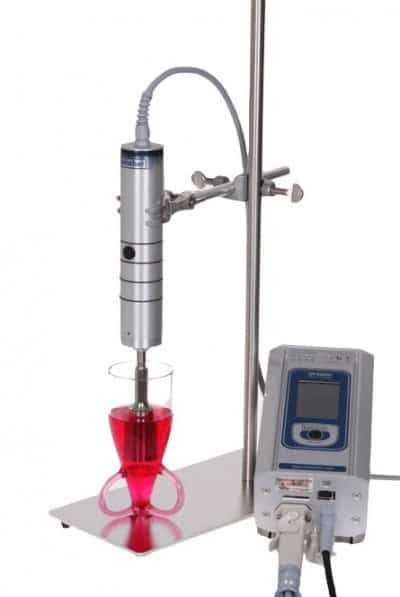 Sonication is a simple and quick approach that not only produces instant results similar to the traditional stirring methods but also avoids the use of toxic solvents. The isomerization rate trans to cis, in ethanol solution, decreased with inclusion. The dissolution studies revealed that resveratrol dissolution rate was improved by the formation of inclusion complexes. Hielscher Ultrasonics is specialised on the development and manufacturing of high performance ultrasonic equipment for lab and industrial applications. Built on industrial standard, the robustness of all Hielscher ultrasonicators can be reliably operated 24/7 at heavy duty and in demanding environments. 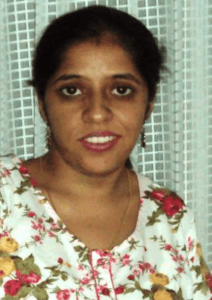 Dr. Khushwinder Kaur is assistant professor at the Department of Chemistry of the Panjab University in Chandigarh. In 2010, she has done her doctorate by researching the effect of additives on the microstructure and properties of reverse micelles. Since 2012, the main aim of her research group is to establish the colloidal basis of physiochemical and physiological properties of nutraceuticals and bioactives with particular focus on optimizing distinctive, effortless, proficient and innovative methods for preparation. Dr. Kaur’s group specializes in fabrication of soft assemblies such as nanoemulsions, biodegradable nanoparticles, and cyclodextrin based supramolecuar assemblies (inclusion complexes) for the efficient delivery of bioactives with natural components. Presently the group is exploring the potential of benzylisothiocyanate in the aid of various nanoassemblies. Khushwinder Kaur, Shivani Uppal, Ravneet Kaur, Jyoti Agarwal and Surinder Kumar Mehta (2015): Energy efficient, facile and cost effective methodology for formation of an inclusion complex of resveratrol with hp-β-CD. New J. Chem., 2015, 39, 8855. Vittorio Bertacche, Natascia Lorenzi, Donatella Nava, Elena Pini, Chiara Sinico (2006): Host–Guest Interaction Study of Resveratrol With Natural and Modified Cyclodextrins. J. Incl. Phenom. Macrocycl. Chem. 55, 2006. 279. James M. Smoliga, Joseph A. Baur, Heather A. Hausenblas (2011): Resveratrol and health – A comprehensive review of human clinical trials. Mol. Nutr. Food Res. 2011, 55, 1129–1141. Resveratrol is a stilbenoid, a type of natural plasma polyphenol, a phytoestrogen, as well as a phytoalexin produced by several plants in response to injury or, when the plant is under attack by pathogens such as bacteria or fungi. Therefore, resveratrol can be classified as adaptogen, too. Chemically, resveratrol is described as trans-3,4′,5-trihydroxystilbene (formula: C14H12O3). It is polyphenolic, non-flavonoid antioxidant, found in grapes, nuts and berries, and offers powerful antioxidant and anti-aging properties. Therefore, resveratrol is a valued ingredient in pharmaceuticals, nutritional supplements / nutraceuticals, and cosmetic products. Other dietary-administered polyphenols with major health benefits include catechin, quercetin, silibinin and curcumin. Resveratrol exists in trans and cis isomeric forms of which the trans form is more stable when exposed to light and increasing temperatures. An inclusion compound is a complex in which one chemical compound – the so called “host” – has a cavity into which another compound – the so called “guest” – is included. Cyclodextrins are the most commonly used host compounds, since they can form inclusion complex with a wide variety of solid, liquid and gaseous compounds. Guest compounds range from polar reagents such as acids, amines, small ions (e.g. ClO4– , SCN–, halogen anions) to highly apolar aliphatic and aromatic hydrocarbons and rare gases. 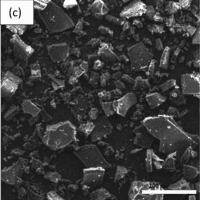 Inclusion complexes can be synthesized either in solution or in the crystalline state. Mostly, water is used as solvent, although dimethyl sulfoxide and dimethyl formamide can be used as alternative solvents. Besides the inclusion of pharmaceutical / nutraceutical compounds, cyclodextrin is also used as host compounds for fragrance molecules to achieve a higher stability and a slow-release action. Other inclusion “host” molecules are calixarenes and related formaldehyde-arene condensates. The research field of synthesizing inclusion compounds is known as host-guest chemistry. Cyclodextrins are a type of chemical compounds made of sugar molecules which are characterized by their ring form. Starch is the raw material from that cyclodextrin are synthesized by enzymatic conversion. Since cyclodextrins have a hydrophobic and a hydrophilic side (hydrophobic inside and hydrophilic outside), they can form complexes with hydrophobic compounds. By enclosing a hydrophobic molecule (“guest” molecule), cyclodextrins can enhance the solubility and bioavailability of such compounds. Furthermore, they are also used to improve the drug permeability through mucosal tissues. This is of high interest for pharmaceutical as well as dietary supplements in order to deliver hydrophobic compounds. The forms of alpha-, beta-, and gamma-cyclodextrin are all FDA-approved and recognized as safe drug carrier. Lyophilisation, also known as freeze-drying or cryodessication, is a low temperature dehydration process which involves freezing the product, then lowering pressure to remove subsequently the ice by sublimation. Sublimation is defined as the process when a solid (e.g. ice) changes directly into vapor/gas state without first going through a liquid phase (e.g. water). During controlled lyophilization, where the product temperature is kept low enough, changes in the characteristics of the dried product are avoided. This is crucial in order to obtain a high quality extract. Freeze drying is an well-established technique to separate heat-sensitive materials such as proteins, microbes, pharmaceuticals, tissues & plasma. Nutraceuticals gain increasing attention as they offer safe health-supporting qualities. Defined as molecules with a variety of physiological benefits as well as protective capacities against diseases (such as cardiovascular disease (CVD), obesity, diabetes, cancer, chronic inflammatory disorders and degenerative diseases), the market for high quality supplements is rapidly growing. Nutraceutical formulation strategies reported in the literature include: liposomal carrier systems (e.g. liposomes, transferosomes etc. ), micro- and nanosponges, nano-crystals, cyclodextrin complexation, biodegradable hydrogels, nano-emulsions / miniemulsions, nanostructured lipid carriers, micelles, nano-particles, nanocapsules and nano-encapsulation, self-emulsifying drug delivery systems (SEDDS) and microparticulate systems (e.g. microparticles, microspheres, microcapsules).